Insects are something that I generally find annoying. I'm that guy who gets bit when nobody else sees mosquitoes around. It isn't a fear, it's annoyance. On the other hand, Butterflies are something that have a special place in my heart. My Mexican Milkweed is there specifically because my Godmother, Kathie knew that I liked the Monarch Butterflies and gave me seeds. The plants always look like sticks as a result, but that's why they are there - food for the Monarchs. As a result there are always some around. When I got a chance to go to the butterfly house at Fairchild Tropical Gardens, I finally got to a place where I could stand around looking at these gentle creatures for as long as I liked. It is an odd building. A giant structure with windows and screens everywhere, but in order to go in, you have to enter an air lock. Most of these species on display would establish themselves out in the wild here. Since there are quite enough invasive species roaming South Florida, this minor inconvenience is well worth the effort. Inside, there are plants specifically placed as food for the butterflies, a beautiful babbling brook of a fountain, and posts with fruit sitting on top as a feeding station. 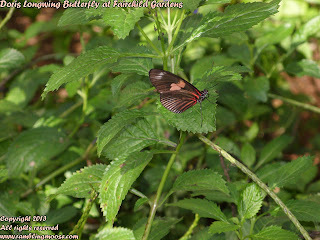 All the time you are there, you are being circled by flocks of these exotic butterflies. Creatures that you see sometimes out in your yard are mostly too common. My beautiful orange and black Monarchs or the Swallowtails that lay eggs on my citrus trees are simply not housed in this habitat. For someone who says that "Butterflies lower my IQ 10 points", a visit to a butterfly house was one of those wide-eyed moments of wonder. A moment of beauty well worth the trip. Needless to say, I've got plenty of pictures on the camera to share. Nice picture. Yes, we like our milkweed that attracts butterflies. The plant in the picture looks like maybe pentas or lantana. I've got them growing in the backyard too.